The op-ed below by Drexel University President John A. Fry and Stephen Gardner, Amtrak’s executive vice president for infrastructure and investment development, appeared in the Nov. 16 edition of The Philadelphia Inquirer. Without even putting a single shovel in the ground, the far-reaching plan that we and our public partners just launched to transform Philadelphia’s major transportation hub may well be changing the way business and state and local leaders look at the future of the city’s downtown. The recent announcement that Aramark will move its headquarters more than a mile from its namesake tower to the banks of the Schuylkill is the latest, tangible signal of the growing momentum west of the river. And once Aramark completes its move in late 2018, the company will join FMC, which moved in May, and can expect more new neighbors – firms likely occupying nearby office space that’s on the drawing board today. This westward march helps knit the emerging 30th Street Station District together with an expanding district in Center City. We don’t think that’s mere happenstance. 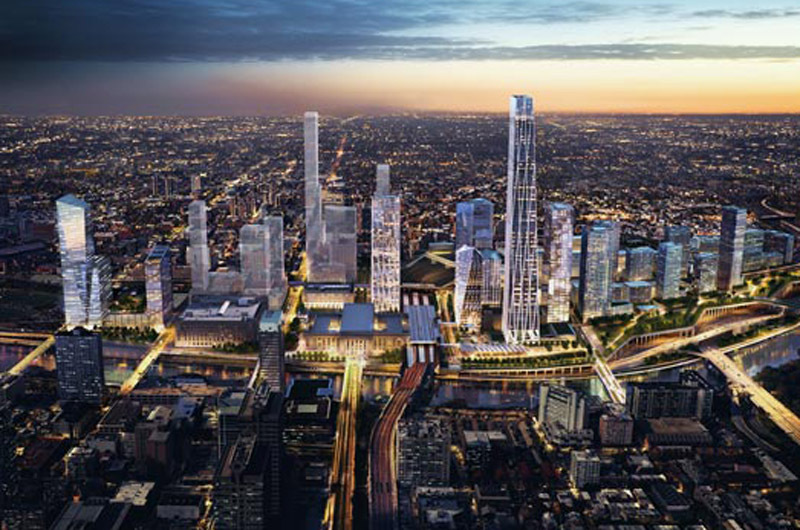 The vision that we announced in the spring for what we’re calling the 30th Street Station District (phillydistrict30.com) – to be coordinated with Drexel University’s plan for an innovation district known as Schuylkill Yards – calls for an entirely new neighborhood. Springing up around the grand dame of railroad stations will be research, commercial, residential, and retail settings, as well as public spaces offering stunning river vistas. We fully expect that, as this plan unfolds over many years, the momentum will keep building, paving the way for the next phase, and the next and so on. But it’s a thrill to see momentum begin with projects like the Aramark and FMC moves. Even though Aramark’s new headquarters will be across the Schuylkill, it will be neighbors to the development taking place around 30th Street Station. Ours is a decades-long initiative, of course, and with a budget calculated in the billions. Beyond securing funding of that magnitude, the logistics of coordinating the many pieces of this project would confound even a veteran trainmaster. Fortunately, at Drexel University and Amtrak, we have skilled and patient partners in SEPTA, the region’s transit agency, the Pennsylvania Department of Transportation, Drexel’s development partner, Brandywine Realty Trust, and the University City District. A fully engaged city administration, and federal officials – who have designated this area a Promise Zone – rounds out a team of heavyweights. We are eager to report progress, and know we must keep everyone with a stake in this project informed and, therefore, engaged. That runs the gamut from commuters to neighborhood residents to business and civic leaders, since the 30th Street District is a crossroads that belongs to every Philadelphian – those here for a lifetime, and those visiting for a day. So how’s it going? Well, passersby at 30th Street Station have seen scaffolding wrapping the exterior for a couple of years. Behind the scaffolding, needed maintenance is underway. While this work was launched before the district plan was complete in the spring, it is a sign that good things are happening. The spade work for key elements of the project gets done long before any groundbreaking ceremony, and in this case that already includes steps such as securing a spot on the Delaware Valley Regional Planning Commission’s blueprint for projects and eventual funding. We’re on the list, and one of the projects is a new terminal for intercity bus travelers who stand outside, subject to the elements, waiting to catch their BoltBus and the like. Similarly, Amtrak expects to seek proposals from the development community this fall for the first parcel it hopes to develop across from the train station. And Drexel will be dusting off shovels before too long. First up, Drexel and Brandywine will break ground in front of One Drexel Plaza – the former Bulletin building – for a 1.3-acre public park, Drexel Square, along with a new, beautifully designed SEPTA head house. In addition to those moves, there’s a good deal of study into how the network of roads, ramps, bridges, and other infrastructure will be impacted under the district plan. That includes proposals to create a new passenger waiting area on the north side of the train station, and also a sky-lit underground concourse linking Amtrak and commuter rail passengers directly to SEPTA’s subway-surface lines. A year from now, we’ll be in a better position to report what the funding picture looks like. For now, we look at the strong public support being provided Aramark – also slated to become Drexel’s new food-service provider next month – as a positive sign. There will be as much as $20.6 million in state development, training, and infrastructure money from Harrisburg, and we don’t think it’s unreasonable to take that as yet another vote of confidence in our efforts to transform the 30th Street District. In reclaiming valuable real estate around and eventually over infrastructure at 30th Street Station, Philadelphia will join other cities that have reimagined their transportation assets. The modernization and expansion of Amtrak’s high-speed Acela service in the next five years will bring additional riders, workers, visitors, and residents to the station. Since, as is often said, they’re not making any more land, we view this project almost as inevitable. And that’s why we’re so enthusiastic when others recognize the power of this idea. For now, we say welcome to the neighborhood, FMC and Aramark.